You have finally made the decision to buy a RV. Now what?? There are so many things to consider when purchasing a RV. It can be slightly overwhelming, but super exciting at the same time. I remember when we bought our first travel trailer, a KZ Spree. We signed a lot of papers, they took our picture standing in front of our brand new trailer, with goofy grins on our faces, and then we were on our way. But how did we get to that point?And how the heck do you know what size trailer your truck can pull?? (more on that later!) With so many brands and floorplans available, how did we make our choice? 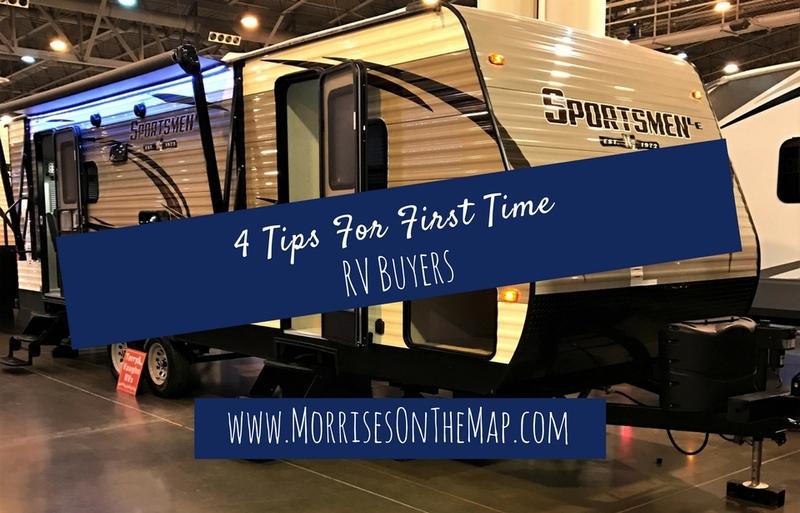 We wish we could go with you on your journey to RV ownership, because we love to look at new trailers, but since we can’t, here are a few tips to help you. Where and for how many consecutive days will I use it? How many people will be using the trailer at a time? Knowing where you will travel and set up your RV will greatly influence the type of RV that will meet your needs. If you want to dry camp in the backcountry, don’t buy the biggest trailer or class A motorhome made. If you will be using your trailer in developed RV parks with full hookups, and you will be staying for months on end, don’t buy a small pop-up camper either. RV’s come in many different forms for many different types of enjoyment. Take time and really consider what type of camping (or RVing) you enjoy the most. You will be limited in one way or another no matter what RV you choose, all RV’s have their positives and negatives, and none of them do everything well. What is right for us, may not be right for you, and that’s okay. Different strokes for different folks! If it is just you and your spouse that will be using the trailer, a one bedroom trailer may be what you are looking for. Those of you, like us, that have kiddos needing their own space, may want to consider trailers with multiple rooms, commonly called bunkhouses. These trailers may have anywhere from 2 to 6 beds. There are even 3 bedroom trailers available now. The number of people in the trailer can also play a part in how many bathrooms you choose to have in your trailer. Again, the length of stays will have a lot to do with the size here. A family of 5 can easily stay a week in a small pop up, but would they want to be that close for a month or more? Knowing how many people will be using it and for how long, will narrow your search immensely. The purpose of having a RV is to take it to the places you want to go, and to do that you must have an adequate tow vehicle to get it there. Since today’s trailers are a little bit heavier than the covered wagons of old, you are going to need a vehicle capable of towing the weight of the trailer you pull. Before you start looking at RV’s, you need to know the towing capacity of your vehicle. There are two important numbers you need to know here, gross vehicle weight rating (GVWR) and towing capacity. A good place to start is to look at your GVWR sticker, usually located on the driver door jamb of your vehicle. This requires a little math on your part. 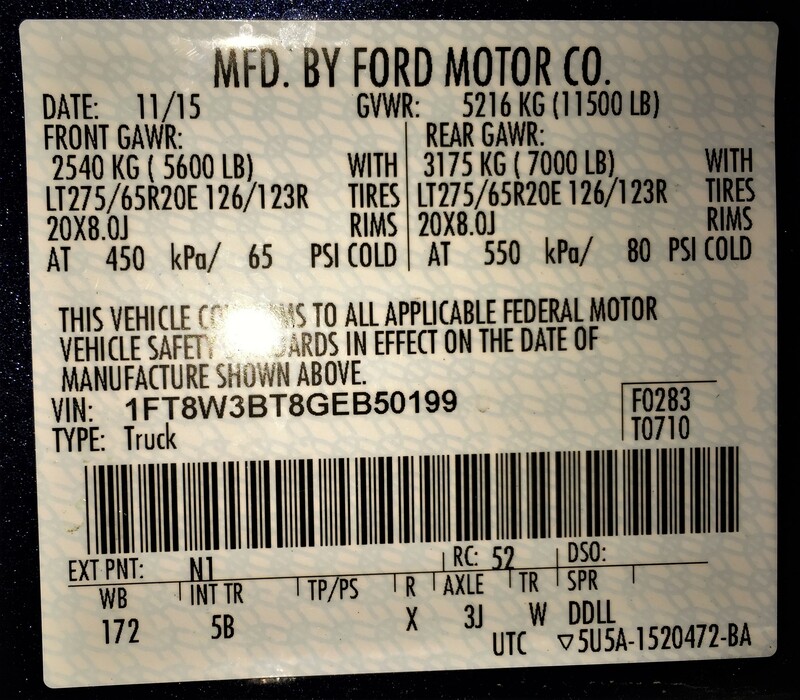 After finding your GVWR on the sticker you will have to subtract the unloaded vehicle weight (UVW or Curb Weight). This will give you how much weight your vehicle can carry, for instance people, fuel, and cargo, including the trailer tongue weight. You will also want to find out what the towing capacity of your vehicle is. You can find this information in your vehicle owner’s manual and in vehicle towing guides. Your towing capacity will depend on engine options and your vehicle’s axle ratio. Also, gooseneck and fifth-wheel towing has a higher towing capacity than conventional bumper-pull towing. This is all about safety, and is absolutely the most important consideration in your decision making process. A vehicle will tow much better and safer when towing within its limits. Your tow vehicle will last much longer with less repair needs when it is not being pushed to its limits. With the price of automobiles these days, most people want to take care of and not abuse their vehicle. Once you know the limitations of your tow vehicle, you will know what trailers you can exclude in your search. There is no need in looking at RV’s twice the weight of your towing capabilities. It is fun to look, just keep in mind that all you are doing is looking. Just because the salesperson says your truck will pull a trailer with no problem, doesn’t mean it will pull it safely. Remember their job is to sell. Your job is to know your towing capacity. It is amazing how much information you can get just from asking people you know. Most RVers love to talk about their RVs. We will tell you the good, the bad, and the ugly. Be careful… sometimes you may get way more information than you want. You can also find a great deal of information about RVs on dealer websites, as well as reading blogs written by RVers. Remember, the more information you have, the better decision you will make! 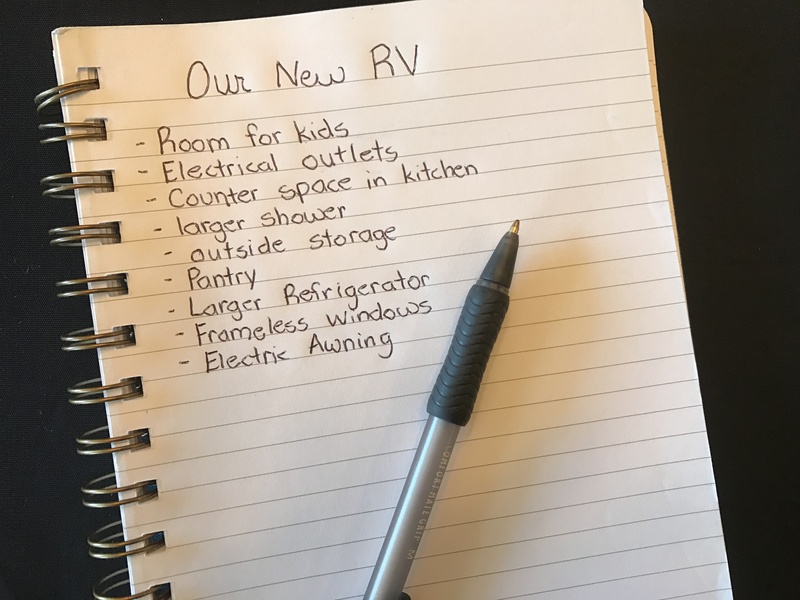 As you are researching, you can start making a list of things you want on your new RV. Since you are first time buyers, you may not know everything you want, what to look for, or what’s available. When talking with other RVers, always ask them what they like about their trailer and what they would change. This can help you decide what should be on your list. Think of things like storage space, counter space in the kitchen, outdoor kitchen, and queen or king sized bed. We had a list when we bought our first trailer, but when we went to buy our second trailer, our list was much more extensive. It is funny how living in a trailer for a year changes your views on what is and is not important.  To find out more about our list of must haves in a trailer, make sure you read Buying a New RV. 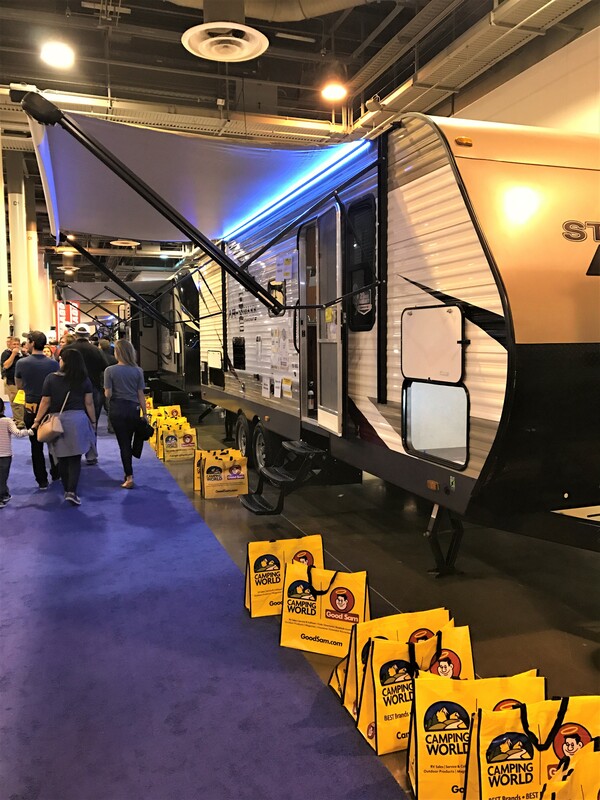 Once you have made a list of your “must haves” and are ready to start looking at trailers, we recommend going to an RV show. Be prepared to be on RV overload by the time you leave. You will find every shape, size, and color trailer imaginable and tons of people looking at them. All kidding aside, this is the best way to see multiple brands of trailers and not have to drive all over town to do it. Typically trailer dealers will bring several floor plans of each brand they sell. All of the trailers are open and you can walk through as many as you like. The more trailers you walk through, the more you will start to notice the quality of workmanship in each RV. You will also start to notice features you like and ones you don’t. We love to go to RV shows just to see all of the new features and floorplans. (Then some years you go to “just look” and 3 weeks later you have a new fifth wheel, but that’s a story for another day.) If you find a brand you like and they do not have a floor plan you like at the show, be sure to ask a salesman. They will always have brochures with floor plan options to give you. They may even have one at the dealership or may be able to order one. 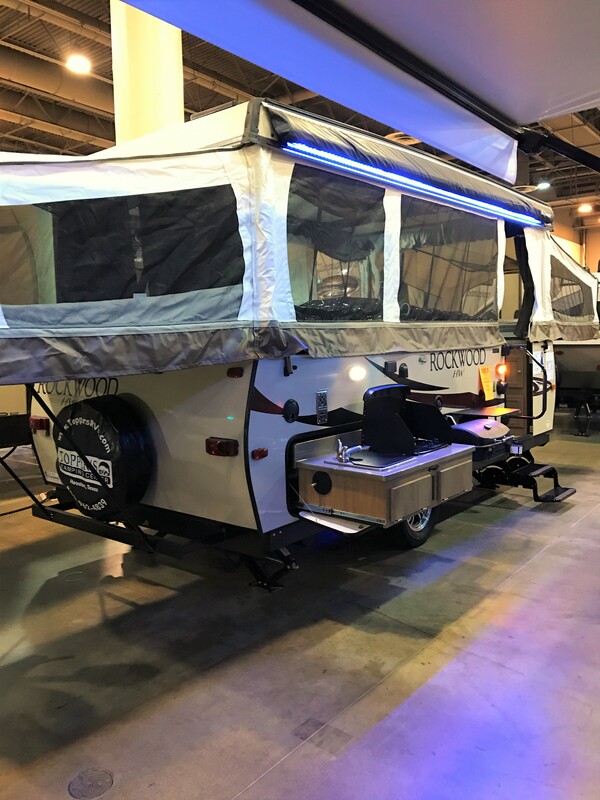 Typically, you can get great deals at RV shows, and they often give incentives for buying. Last year at the Houston show, one dealer was giving away Yeti coolers if you purchased an RV at the show. Both of the trailers we have purchased, we saw for the first time at the Houston show, but we have always wanted more time to think about it. With each purchase, we were able to get the show price or lower just by negotiating with the salesman. Hint: If you like an RV, take a picture of the sign showing the RV show price. That will come in handy when negotiating later if you choose to wait. I hope this article has helped you feel a little less overwhelmed and a lot more excited about making your RV purchase. Have fun shopping and let us know in the comment section what you decided to purchase. We can’t wait to hear from you! Oh, and when you do make your purchase, don’t forget to check out our RV essentials page to get everything you need to get your RV ready to head out on the map! Want to learn more about buying a RV? Click here to find find out our must haves when buying our second trailer. I would add also think about what you will be doing when you arrive at your camping location. For example, if you must have a large truck to pull a fifth wheel that is the vehicle you will have to “run around” in while on vacation. If you plan to do lots of sight seeing then a “toad” or pull behind car might come in handy. Just a thought.